AMANDA LEELA — YOU GOT THIS, GIRL! We can hardly wait for you to get to know this week’s #FEMMEFEATUREFRIDAY, Amanda Leela! This woman is an absolute warrior! It is so inspiring to see how Amanda has cultivated bravery by learning how to move past the obstacles in her life that were completely out of her control. 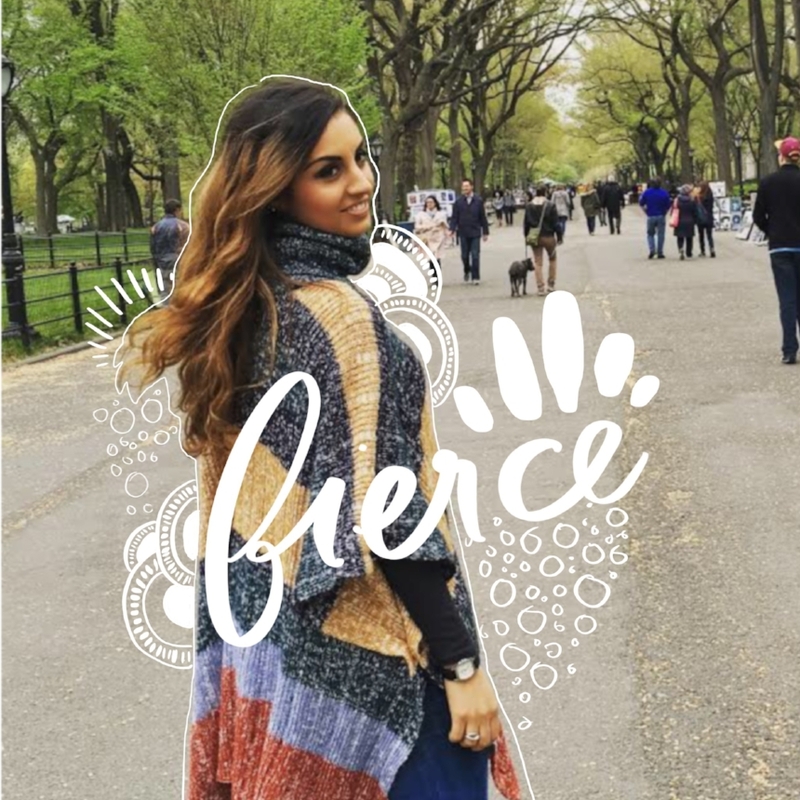 An educator by day and wellness guru by night, this fiery soul is passionate about informing future leaders of what life outside of the classroom is like. What makes her the most special is her determination to remind others of their own exceptionality! A practice of gratitude has shown Amanda just how precious life is and we admire how she inspires others to recognize the blessings in their own lives. Full of both beauty and brains, this incredible girl graduated from The University of Toronto with a Bachelor of Education and Masters of Teaching. Amanda also holds a BAH degree from Queen’s University and aspires to get her PHD in the future! Her hope is to bring her teaching pedagogy into university classes. What a rock star! Additionally, Amanda grew up as a National Level Athlete in figure skating for over ten years. Although Amanda decided to leave figure skating due to unforeseen injuries, she believes this sport taught her about the true definition of dedication, fight and discipline. “I truly believe sports have a profound impact on shaping who we are,” says Amanda. Her athletic background was what eventually led Amanda to her journey to wellness years later. Through social media, she shares the ins and outs of her lifestyle from supplements she uses to how to incorporate them into a nutrient rich and balanced diet. We live in a world where we are being constantly bombarded with images and information. Inevitably, we may find ourselves comparing our journey to others we see through a screen. We absolutely love that Amanda has used her social media platform to not only bring awareness to other girls facing similar issues, but to also let them know that they are not alone! Without apology, Amanda shows the world the reality of what it’s like to live with two autoimmune diseases. She also reminds us about the importance of “me time”. There is nothing more important than taking the time you need to reflect and reset, whether it’s at the gym or even in your bed! Amanda says, “I love the way I feel after my HIIT training days, and on my ‘off’ days I walk for 30 minutes to promote healthy circulation”. It’s that simple! Thank you Amanda for showing us why it is so important to shed light on our stories and love every part of who we are no matter what. You are such a strong woman and we admire how you push through any adversities that stand in your way. Tell us about how you’ve turned any obstacles in your life into opportunities. Life is a funny thing. I say this because through any challenges or obstacles I have faced, that period of time seems like forever until you conquer it and realize how much life there is still left to live. When I was 16 years old and in my grade 12 year, I was diagnosed with Ulcerative Colitis, which is an Inflammatory Bowel Disease that almost took my life, twice. You grow up really fast when you are faced with a life threatening situation, especially when it comes to health because you have no control of your outcome. After losing my colon and having an ostomy bag, this was an obstacle I was not sure how to face at such a tricky age. My subconscious would cause me to rip the bag off while I slept, which was detrimental because it was keeping me alive until my next surgery. I hated not having the luxury to go to the bathroom. Can you believe that? A simple and “private” task we do not think about was something I longed for. However, it was TRUST, trusting the process that my body would adapt and I may not learn to love my ostomy, but I could learn to accept its beautiful power to keep me alive. My Ulcerative Colitis ignited a fire in me I never knew existed. I have never been more vocal, disciplined and willing to get better because my inner being just knew I was meant to do something with this second opportunity at life. I graduated high school that same year even though I was in and out of surgery, I got into all universities I applied to and chose to take the risk of living away from home by going to Queen’s University. My diagnosis was a challenge that allowed me to stop and realize that doing your best does not mean pushing yourself to the point of exhaustion, and instead, making you realize how damn strong the human body and MIND are. Womanhood is existential in the sense that it looks, sounds and feels different to everyone but one thing we can all share under this title is STRENGTH. My favourite thing about being a woman would be our ability to stand out. We all have a story and what good would it do if we just followed the crowd? I feel like we learn the most from each other and from experiences. I am an elementary school teacher where I have seen learning take place in many forms. This is why I am very passionate about educating our children in unconventional ways- i.e. through the arts so that children can go to school to learn academically, socially, emotionally and athletically becoming well rounded and forces to be reckoned with. Furthermore, when I hear the word “woman” my first thought is SUPERWOMAN, otherwise known as my mom. Why? Because my mom has shown me that as a woman you can do 100 things at once and still do it with grace. However, the most important thing is to be kind and never ever be jealous because you’re doing just FINE. Why do you think it’s important to cultivate positive thoughts? How do you strive to stay positive on the daily? MANIC thoughts I had. I was more negative than I had ever been but it was uncontrollable. I felt like there was something in my brain impacting how I thought, which there actually was. I have two parasites resting in my brain carrying Lyme and when they move it creates this indescribable fog. I let myself be upset and I let myself feel angry. I also let myself have time to celebrate that I was not crazy and that my MS test results were negative. The diagnosis actually allowed me to feel more positive because I now knew what was wrong with me and developed an action plan. I can never be cured because of my specific situation and co-infections but I can go into remission and this is a goal I am striving for. I have learned to MANIFEST my health and not just say, “I am healing or on my journey to healing” but actually seeing and visualizing myself as a healthy being. This took practice and dedication but it is extremely important to become in touch with your inner being our SOUL. I think you are what you think you are and if you keep being harsh towards yourself you will continue to feel belittled and incapable of greatness. Abundance: A DayBook of Comfort of Joy by Sarah Ban Breathnach. These are two staples for me because gratitude and simple pleasures are key elements to activating your chakras and putting your mind into a positive headspace. Mondays: Energy work- I see an energy practitioner and have learnt how to restore my aura when it gets knocked down. Tuesdays: Power Cards and Words of Wisdom – I have a package of 50 power cards that I circle through by Louise Hay. Her drawings are very complimentary and reading the words out loud helps you manifest your vibrations for the day. I also choose a sentence as my “words of wisdom” to scaffold me throughout the day. Wednesdays: Meditation – following the Breathe app where you can check in on how you feel physical and mentally and it matches you to suitable mediations. Sunday: Something in NATURE for grounding purposes to kick start the week to come. If you could go back in time and give advice to your 10-year-old self, what would you tell her? Support your sisters! Look at them as your driving force and motivation! No matter the pain or circumstances life deals you, remember that God chose you because he knew you were the person who could handle it. My definition of a YGTGirl is someone who faces their fears and strives to make an impact in the world. One of my favourite quotes is: “Oh darling, what if I fall? But, what I you fly?” This quote resonates with me and my interpretation of a YGTGirl because women must overcome adversity every day.